Plant metabolomics is an important branch of metabolomics study, which mainly analyzes the change of metabolites during different developmental stages or under certain treatments, and uncovers the metabolic mechanisms. To survive at the adverse environment, plants have evolved a sophisticated metabolic system, which responds to the environmental changes by regulating the level of corresponding metabolites. 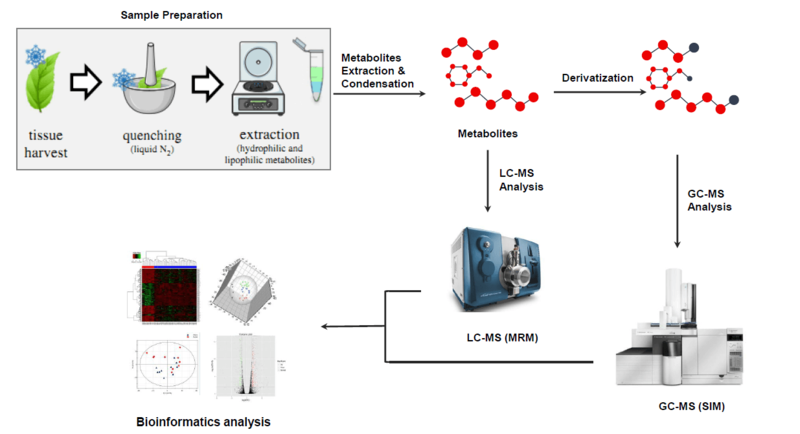 Plant metabolomics helps to uncover the dynamic information of overall metabolites in the plant sample, and thus is a powerful tool for analyzing plant metabolic pathways and regulating mechanisms under certain conditions. Based on Thermo Q Exactive and AB Q-TOF 5600 mass spectrometry systems, MtoZ Biolabs is proud to offer high-efficient and accurate plant metabolomics analysis service, specific to primary and secondary metabolism analysis. We provide custom service based on your specific research requirements, and assure comprehensive analysis service with the highest accuracy. 1. Sample storage: Extraction of metabolites should be performed right after sample collection steps, otherwise, samples should be stored at -80°C, and shipped with dry ice. 2. Sample pretreatment: After sample collection, you can either perform sample pretreatment, or contact us for specific sample pretreatment service.